One can think about freedom in order to formulate principles; nevertheless, we can also recall events in which freedom shows itself as a phenomenon. The events of the year 1968, from Paris to Prague, can exhibit freedom as it was present in the experience of their participants, that is, for students, workers, peace activists, journalists, reserves, veterans, etc. Freedom was present in the experience of the thousands who marched through the streets with Martin Luther King, and without him after his assassination, who marched through the Latin Quarter and who were inspired by them to strike days later, who were engaged in spontaneous acts of nonviolent resistance after the Soviet-led invasion of Czechoslovakia. Nonetheless, just as it is difficult to imagine those events marked by the year 1968 without crowds, it would be a mistake to forget that an enormous number of protests culminated in violent clashes between police and demonstrators, in West-Berlin, Munich, Paris, Lyon, Nantes, and many other cities. Tanks and military paratroopers were surrounding both Prague and Paris. Violence and threats of violence as an instrument to achieve political goals were present also in the bleak aftermath of 1968, as exemplified by the RAF whose members killed 36 people in their terrorist actions, while previously having been amongst those active in protests. Actually, the events we associate with 1968 occurred roughly between 1964 and 1969. One of the iconic figures of these events, Rudi Dutschke, stressed, in his account of what occurred in those years, the anti-authoritarian character of the gatherings that formed the core of protest events: meetings, assemblies, councils, rallies, seizures. Anti-authoritarian protests can be interpreted as manifestations of freedom insofar as these events included a claim to reinvent power relations. Thus, these events from Paris to Prague articulated something more than just the youth’s will to disobey. It is likely that those attempts to reinvent power relations in respect to freedom were articulated out of a disillusionment with political life as it was practiced after the war. Nonetheless, the events of 1968 were shaped in contrast to an even wider field of power that encompassed post-war politics oriented to the management of social conditions for modern industrial production. The phenomenon of 1968 arose in opposition to diffuse modes of conducting others as well as oneself, in which human beings were primarily seen as resources to be utilised in economic and military institutions. The events of 1968 gave rise to, and still bear witness to, a new understanding of what really matters and how to act. In those years, involved commitment entered public places again. Politics depends on the stand we take, not simply on our opinion, but on what we do. For those involved in the events of 1968, meaning and commitment were entwined with their lives because they could experience, in these events, that there was something at stake. Perhaps, for many, these events and what their participants were involved in appeared ridiculous. Mainly for this reason, we should not forget that what we know as 1968 was embedded in a new cultural background given form, for instance, by the music of the Sixties, in which various rock groups articulated in their songs, concerts, and festivals an atmosphere in which contemporary concerns with a serious, productive life were dissolved. Hence, the importance of 1968 does not reside in new answers to already established political questions. Rather, these events demanded a commitment from the participants to answer, through active involvement, newly discovered questions.The legacy of 1968 does not lie in our answers to political questions related to peace, love, equality, and freedom. The inheritance of 1968 is formed by our recognition of these questions’ political significance. If we think about cultural consequences of 1968, we can see that the anti-authoritarian character of those events can be linked to movements articulating the refusal of certain types of medical as well as pedagogical rationality. Only as we follow nowadays how various forms of counter-conduct spring up from events which for contemporaries were manifestations of misconduct, can we make clear how those events were related to a diffuse generational resistance against post-war forms of modern power deployed through educational, medical, administrative, and managerial knowledge, institutions, and practices. At the centre of these events, which expressed the will to be insubordinate to institutions which organised daily existence, we can find the problematisation of obedience. This is a crucial link between 1968 in Paris and Prague, events in the West and in the former Eastern bloc. The slow emergence of discourses about the communist, fascist and respective Nazi terror from the early 1960s onwards led to a delegitimisation of a general institutional order of obedience grounded on pure violence. Discourses on terror played a significant role in the events of 1968 because they opened up the question of the responsibility of those involved in practices of terror, as in the Frankfurt and Munich protests again Nazi professors. Nonetheless, these discourses also made it possible to raise the question of how far or close contemporary institutional forms of obedience could be located from the order of terror organised by the state. In this sense, various modes of counter-conduct formed a part of the resistance against those daily practices of observation, judgment, and instruction implemented to conducting human beings, which continually ordered them as sick or healthy, loyal or treacherous, skilled or incompetent, motivated or indifferent, mad or sane, trustworthy or unreliable, etc. In other words, what the participants of those events understood as anti-authoritarian protest could be sociologically interpreted as episodes of the recurring history of anti-obedience struggles. The events of 1968 manifested various forms of counter-conduct articulating the refusal of post-war forms of ordering conduct, and this calls for a sociological interpretation along the following dimensions: the emphasis on the personal internal life, which, instead of humility and obedience to contemporary authorities, resembled an ascetic refusal of the world of established institutions and its modes of gratification in favour of self-mastery. As various ways of achieving meaningful internal life, through devotion, activism, music, meditation, or following gurus demonstrate, forms of counter-conduct do not exclude relationships of obedience, neither as observance of a doctrine nor as unlimited obedience of one person to another. In this respect, the formation of communities and the newly established collective claim to legitimacy was crucial. As the diversity of doctrinaire foundations and internal authority relations revealed, there cannot be found a single code of their social formation, such as the tendency to suppress the social division between experts and non-experts in order to encourage participation and achieve equality. Nevertheless, communities accepting the significance of meaningful internal life were crucial places to confirm the privileged status of experience that escaped the regime of visibility established through dominant institutional practices of observation, judgment, and instruction. Music, dance, singing, love, and other forms of joyful excitement were witness to immediate communication, to an inspiration by what is perceptible presence. Thus, meaning was given in deep experience, not in that provided by institutions in the form of a truth produced through observation, examination, and teaching. The privileged status of experience was current not only in mystic dialogues between meditating or demonstrating individuals and the universe, but also in the claims of veterans, workers, African-Americans, Latino migrants, Holocaust survivors, dissidents, and various others who sought attention, who demanded to be taken seriously as eyewitnesses of suffering. These spontaneous attempts to re-evaluate the status of memories, testimonies, were interconnected by returns and turns to texts that formed the background of various forms of contemporary teaching and intervention. These re-readings of Marx, Hegel, and various texts from the East, did not necessarily search for privileged teaching but occurred in pursuit of a confrontation and engagement between teaching and experience, seeking to develop a new understanding of what really matters and how to act. For all we know, 1968 does not lead to the end of the post-war world; nevertheless, these events can be treated thoughtfully as signs of the erosion of the post-war world as contemporaries knew, imagined, and took possession of it. In the post-1968 era, several institutions have made efforts to re-utilise certain modes of counter-conduct from 1968. Despite these efforts to reinsert practices of counter-conduct as innovations into the institutional order of obedience, 1968 revealed that cultural sources of meaning both in political as well as everyday life cannot be condensed to spheres of work and production. We can find ourselves in situations in which efforts to sustain our social life together in unity with an “orientation” to the earth and other human beings seen as resources to be utilised loses its self-evidence. Then, we will be able to see that bestowing meaning on our life out of freedom and for freedom is not ridiculous at all. 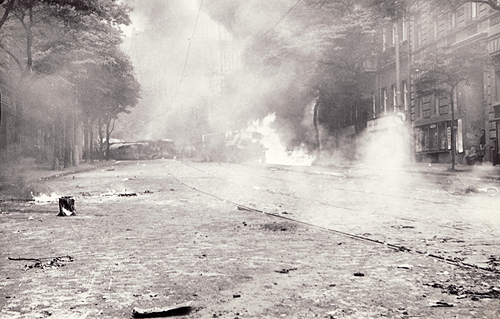 Photograph source and copyright: Archiv bezpečnostních složek [Archive of Security Services], přírůstek fondu Správa StB Praha ze 4. 7. 2007, karton č. 89 – Dokumentace „21. srpen 1968“ [‘21st August 1968’]. Sica, Alan, and Stephen P. Turner, eds. 2005. The Disobedient Generation: Social Theorists in the Sixties. Chicago: University of Chicago Press. Foucault, Michel. 2009. Security, Territory, Population: Lectures at the College de France 1977--1978. New York: Picador. Patočka, Jan. 1996. Heretical Essays in the Philosophy of History. Chicago: Open Court.